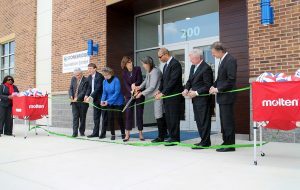 The ribbon is cut and the nets are up at a new $7 million sports complex in Chesterfield. Richmond Volleyball Club on Wednesday christened its new 55,000-square-foot facility at Stonebridge, a mixed-use development on the site of the former Cloverleaf Mall. 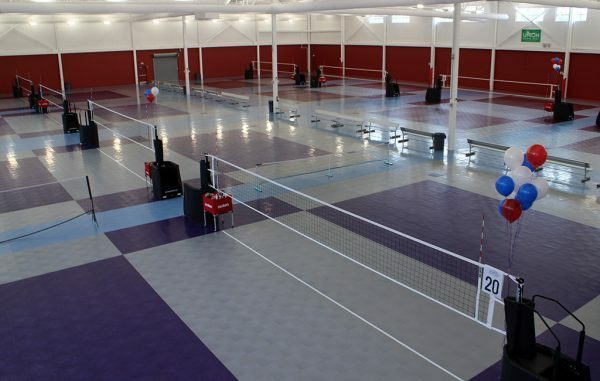 The building at 200 Karl Linn Drive in North Chesterfield has eight volleyball courts and a mezzanine viewing area. The county-funded project was first announced in 2017. The county owns the land and building, which RVC is leasing. Chesterfield’s Parks and Recreation department is taking 5,000 square feet for its Stonebridge Recreation Center, which will host fitness classes and events for Chesterfield’s senior population. Founded in 1981, RVC offers leagues for players of all ages and abilities, as well as Special Olympics events, sitting volleyball, private instruction and events. The nonprofit club has about 3,000 members and reported $2.9 million in revenue in 2016, according to nonprofit tracker Guidestar. Executive director Darcy Carroll said RVC will wind down operations at its current West End facility at 1907 Westmoreland St. in May. Its location at 2921 Byrdhill Road, which it purchased in 2009, will remain in operation. EDC, Baskervill and the Timmons Group were the project’s general contractor, architect and engineer, respectively. The Stonebridge development has been built in phases since the Cloverleaf Mall was demolished in 2011. The first residents of the project’s apartment complex, Element at Stonebridge, moved in in 2016. The site is also home to Stonebridge Marketplace and anchored by a Kroger store. In February, autism clinic Spectrum Transformation Group broke ground on a facility at the development.